We bought this about a year ago. We love it. Comfy on bare feet! Looks just like the picture. A chic update of mid-century modern style, this 8' square rug from Safavieh's Retro Collection evokes 1960s flair. The perfect complement to clean-lined furniture, this rug features an abstract motif in a neutral color palette of grey, ivory, and black. This plush rug features a design resembling free-form wide chalk colored brush strokes on a charcoal colored backdrop. Its unsystematic design easily adds visual intrigue to any space with its Art Deco inspired style. Soft polypropylene fibers provide a dense half-inch pile designed to withstand high-traffic living rooms, dining spaces, and foyers. This rug is also power-loomed to ensure durability, longevity, and a virtually non-shedding rug. Easy to care for, and picturesque in design, this rug will easily brighten up a living room, bedroom or office with its modern elegance. The picture of the rug does not show the true detail of the rug. The blending of the colors gives the room a special look. The thickness of the rug feels wonderful. This rug was a bargain. The colors blend will with my light gray walls. I would buy from this company again. 5 stars in every category. 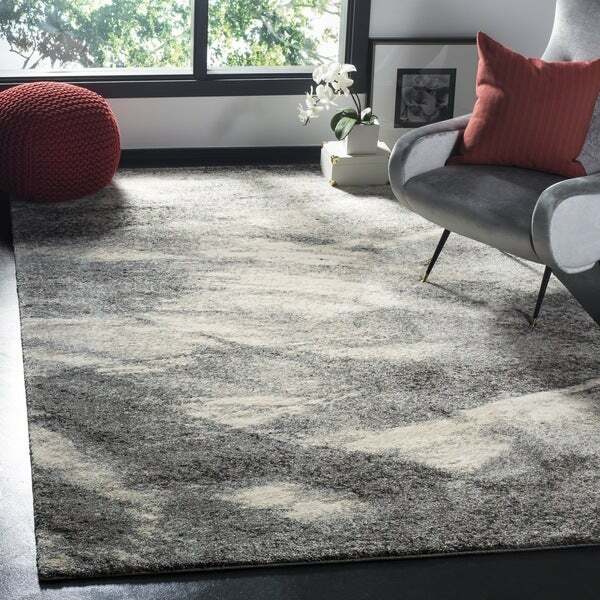 Want gray/neutrals contemporary design rugs that are soft and hold up well? This is it. They do not shed! : ). Great buy; so pleased I found these. This rug arrived 2 days after ordering. It was well packaged. I unrolled it and at first thought it was thin....then I stepped onto it. It is very plush! Short, but dense pile. This size is great for my living room. I do have a couple of heavy objects on the ends to help it lie flat. There is a lot of ivory color in it, which I like. My floors and furniture are dark, and this is a nice way to lighten the room. It vacuums nice and my dog seems to love it too. The black in this rug does not overwhelm. The Carson Carrington Hamar Mid-Century Modern Abstract Grey/ Ivory Rug - 8' Square Came as a Safavieh Hamar Mid-Century Modern Abstract Grey/ Ivory Rug - 8' x 8' Which was fine. Rug quality was super! Vibrant colors. This was one of six items ordered at same time. Five were delivered by UPS in a manner that exceeded expectations. This order was to be delivered by FEDEX and two days after delivery date, FEDEX was notified, they asked for an additional two days to trace. On the third day I corresponded with FEDEX and they said rug was lost and to contact Overstock. I did, Overstock was super! sent another rug within two days, very grateful, Thank you Overstock!! 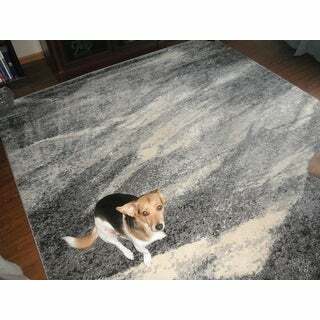 Then the first rug was delivered without any notice, even though Overstock had removed the rug from our account we sent it back and the next day Overstock informed me it had received both rugs. Excellent customer service form everyone at Overstock, Thank you!! We absolutely LOVE this rug. The color is perfect for our room. Perfect size for our room. Excellent quality and very soft. We would definitely recommend this rug. Super soft! The light portion is definitely more beige than white as pictured. The rug was cut unevenly and has a curve on two of the corners. You get what you pay for. This rug was perfect for my family room. The rug is soft and the mix of grey colors went perfectly with my furniture. I was a little hesitant when I ordered this rug because I wasn't sure of the quality and color, but once it arrived and I placed it in the living room I was very pleased. The color blend is great, it is very soft, does not shed and looks great! I purchased this rug for the living room to go with our gray leather couch and recliner. The colors work great and the 8' x 8' size worked perfect. I'm very happy with the quality and softness of this rug. Fast delivery. Looks exactly how it was shown. Delivered in highly protective way. Love the color and it's so soft when walking on it with no shoes. Nice rug! Arrived fast; great quality! Beautiful Rug! Colors are just as shown in picture and very soft to walk on. If you order you won't be disappointed! I've had this area rug for a week. I love the color and softness of it. It matches perfectly in my new home! Great quality! "Hello. Could an office chair roll over the rug easily? lrm"
This may vary from chair to chair, however this is intended to withstand high-traffic areas. "How accurate are the colors? I'm looking for a "darker" rather than "lighter" color...more toward charcoal gray/black rather than lighter color. Is it possible to request that?" Hello jkgrey, we try to represent the colors of our products accurately. Unfortunately, due to the difference in monitor colors we cannot guarantee that the color will match exactly what you see on your screen. Thank you for shopping with us. Redoing our family room, can't wait to see it on my new flooring. I have a decent size living area with two very dark brown couches and have introduced gray drapes with beige in it and I hope this rug will make the area of the room pop as an accent rug. Will let you know. "Is this a cut pile or flat weave?" Hello janeherenow, we appreciate your inquiry. This item is a cut pile. We hope this information has been helpful. Thank you for shopping with us. Have a great day!